Ford tests the limits of its autonomous driving tech by switching off the headlights of its Fusion hybrid and allowing the car to drive in total darkness. San Francisco - Picture an 18-wheel truck barreling down the highway with 36 tons of cargo and no one but a robot at the wheel. Anthony Levandowski, a robot-loving engineer who helped steer Google's self-driving technology, is convinced autonomous big rigs will be the next big thing on the road to a safer transportation system. 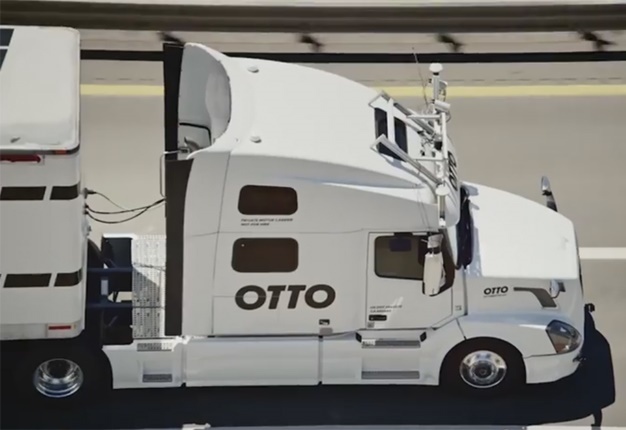 Otto is aiming to equip trucks with software, sensors, lasers and cameras so they eventually will be able to navigate the more that 354 055km of US highways on their own, while a human driver naps in the back of the cab or handles other tasks. Levandowski says: "Our goal is to make trucks drive as humanly as possible, but with the reliability of machines." READ: Autonomous era - What about sports cars? Shladover says: "I don't want to be on that highway when there is nobody there to take over a truck with 80 000 pounds of cargo and I don't think I know anyone else who would want to be. "The consequences of any kind of failure in any component would be too severe." Google's self-driving cars have logged about 2.57-million km in autonomous mode without being involved in an accident that resulted in deaths or major injuries. Of the more than 20 accidents involving its self-driving cars, Google has accepted the blame for only one - a February collision with a bus in Mountain View, California. Otto went to Nevada because California's self-driving regulations apply only to passenger cars, forbidding the technology from being used on public roads by commercial trucks or any vehicle exceeding 10 000 pounds. Now, Otto is looking for 1000 truckers to volunteer to have self-driving kits installed on their cabs, at no cost, to help fine-tune the technology. The volunteer truckers would still be expected to seize the wheel and take control of the truck if the technology fails or the driving conditions make it unsafe to remain in autonomous mode, mirroring the laws governing tests of self-driving cars on public streets and highways. The startup touts its technology as way to make up for a worsening shortage of truck drivers as more of them retire without enough younger drivers to replace them. Last year, the shortage stood at 47 500 and, unless recent trends change, will rise to nearly 175 000 by 2024, according to the American Trucking Associations. Dave Osiecki, executive vice president and chief of national advocacy said: "The trade group hasn't taken a stand on self-driving technology, but may draw up a policy later this year. "We are paying close attention because this could be huge for trucking in terms of labor costs and safety." Levandowski insists self-driving trucks aren't as scary as they might sound. Robot truckers are less likely to speed or continue to drive in unsafe conditions than a human, and will never get tired. Between 10% and 20% of the roughly 4000 fatal accidents in the U.S. each year involving trucks and buses are linked to driver fatigue, based on estimates gathered by the National Academies of Sciences, Engineering and Medicine. "It's really silly to have a person steering a truck for eight hours just to keep it between two lines on the highway," Levandowski concludes.